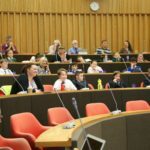 Despite the awful weather, pupils from Weeth, St Meriodocs, Penponds and Rosemellin junior schools had a great day at County Hall engaging in Camborne Regeneration Forum’s 5th annual Youth Conference. Alan Butterfiels, chairman of Camborne Regeneration Forum, introduced the Conference. Ivor Corkell, from Camborne Old Cornwall Society, gave a presentation entitled ‘Nothing is for ever’, talking about & showing pictures of Camborne’s heritage. Miles Carden, Director of the Spaceport project at Newquay Airport showed us the exciting future for space travel from Newquay. Don Gardner, of Transformation CPR, spoke about Food bank in our area & Chrissie Barrett, the West Cornwall Community Safety Officer, outlined actions from the Safer Camborne project. 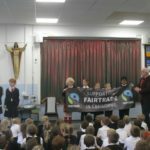 Emily McCoy, from Fairtrade HQ, showed us the role that Fairtrade plays in helping producers in the poorer countries have a fair deal from the goods that they produce. 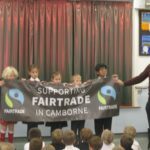 Camborne is a very successful Fairtrade town – one of only two in Cornwall. Richard Williams, retired chief lawyer at Cornwall Council, chaired a debate with questions from the pupils, which were far reaching as they didn’t hold back with their thoughts on the past & future for Camborne. Four out of five people in Cornwall think recycling household rubbish is very important according to the results of a survey published today by Cornwall Council. 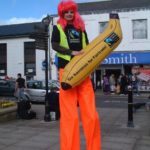 Last December Cornwall Council conducted a survey to better understand what people think about recycling, their attitudes to food waste and what would help people to recycle more.